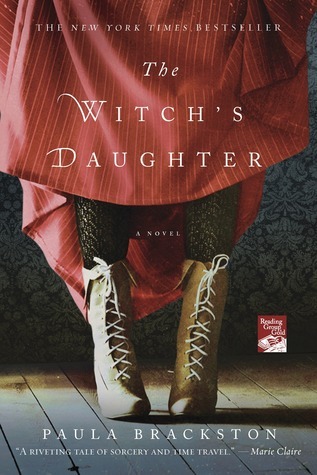 The Witch’s Daughter isn’t some epic fairy tale told over many lifetimes. It’s not a drama-filled, romance story that will twist your heart in knots. But it will still leave you a little bit breathless. Elizabeth is just a girl when she loses her father, brother, and little sister to the plague. When she becomes sick, her mother does what any mother in her situation would do; save her last remaining child’s life through any means necessary. She goes to Gideon and it is his teaching ways and power that saves Elizabeth’s life, but at a huge cost. It is this action that starts Elizabeth on her journey through time, always looking over her shoulder for the one who wants to own her, yet trying to build a life wherever she can. The book is told through two perspectives: the journal entries in The Book of Shadows and as Elizabeth telling Teagan stories. This isn’t distracting at all and only makes the story more inviting, in my opinion. The Book of Shadows is written in the present time. It talks of Elizabeth’s life now and her interactions with Teagan. She is teaching Teagan the ways of the hedge witch and in doing so, allows herself to feel for another person; something she hasn’t done in many, many years. The rest of the novel is about Elizabeth’s many lives, from treating prostitutes in Jack the Ripper’s London to the war front of World War I. She is helping as many people as she can wherever she lives, trying to stay out of Gideon’s path, trying to save herself from becoming his. She tries to avoid magic whenever she can, as using her magic calls Gideon to her. It is a special kind of heartbreaking to see Elizabeth go through so many lives, trying to not form attachments, yet yearning to find someone to love her. She knows any bonds she forms will be broken when the other person dies, but solitary life isn’t good for anyone and Elizabeth’s heartbreak hurt to read. The ending of the novel is exactly what I wanted, and yet I wish there was just a little bit more. Not because the novel needed more, but because I wanted to know more. The Witch’s Daughter isn’t a romance. It isn’t an action novel. It isn’t a drama. It’s a historical fiction novel that has a little bit of everything. I’m glad I decided to pick this book up and look forward to reading more from Brackston. This entry was posted in Historical Fiction, Something a Little Different and tagged Fantasy, Historical Fiction, Paranormal, Paula Brackston.